All summer I have wanted to post about the great fruit and vegetables that my garden is providing. Now summer is almost over and autumn is knocking on our door so I’ll have to hurry to get in at least one or two of my favorites. Ok, so this isn’t Tibetan medicine per se. 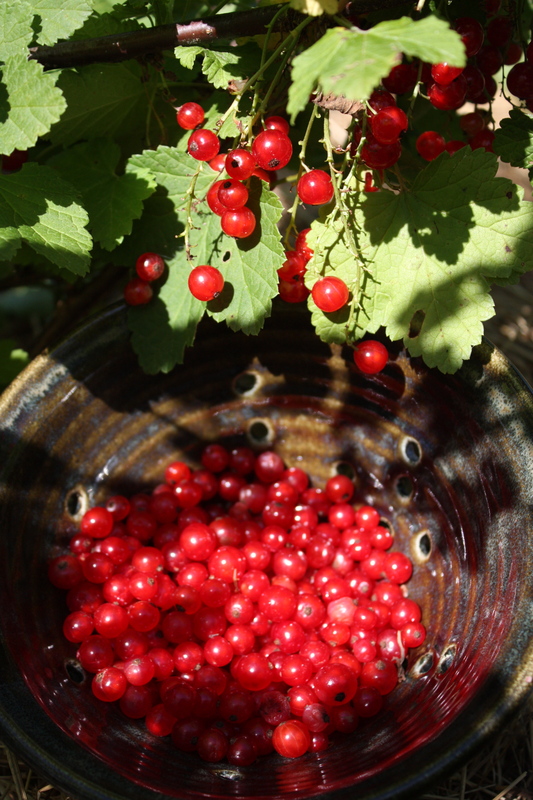 It is more like favorite summertime cooking projects in the guise of Tibetan medicine, but it is fun to look at what nature provides for us and how it fits into Tibetan medicine seasonal, dietary guidelines. In many parts of the world the summer is monsoon time when the earth is made moist and wet by plentiful rain. As the earth is cooled and vapor rises, the quality of drinking water often becomes dirtier (remember that the main medical texts were written before modern water systems.) The poor quality of the water plus the change in temperature tends to weaken our digestion so the Tibetan medicine recommendation is to eat foods that are sweet, sour and salty, plus light, warm and oily. These tastes are considered the most nutritious of the six tastes and balance our bodies and support our digestion during the summer season. Luckily for us these are just the kind of foods that nature provides. My new favorite jam, which I discovered accidentally trying to figure out what to do the rest of my red currants, is a combination of gooseberry and red currant. 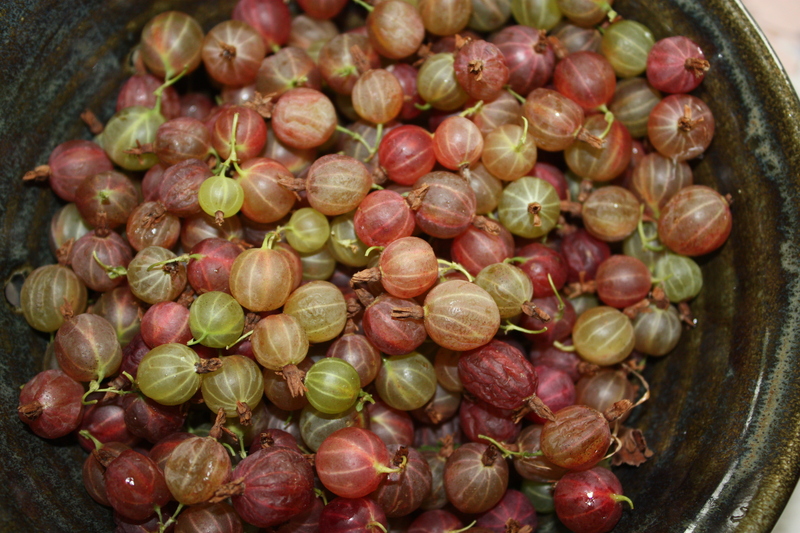 If you have these berries in your garden or see them at market they are terrific paired together and boiled with some sugar until just thick enough. 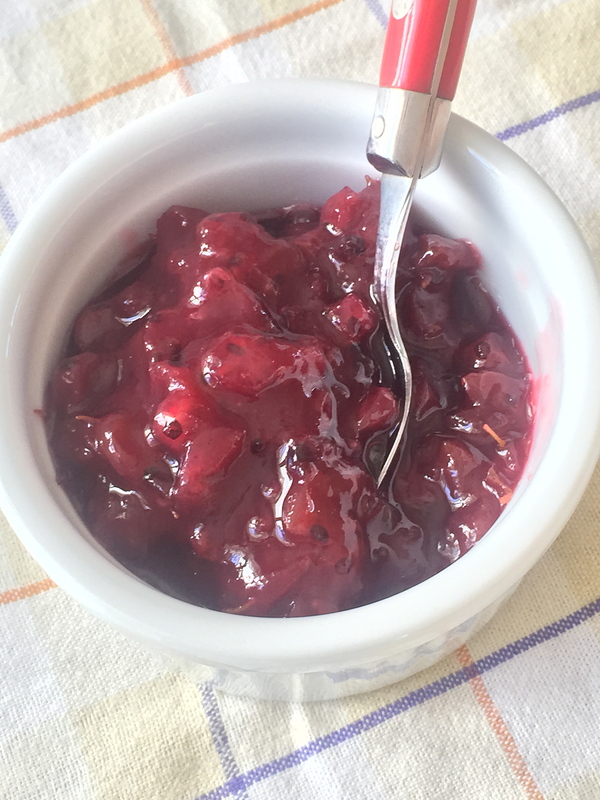 I used about 3 cups of berries and 1 cup of sugar or honey and no pectin. There is enough pectin in the skin of the fruit, just let it simmer and stir for about 15 minutes. Honestly, these are ballpark figures so feel free to experiment. This jam is wonderful! Sweet, sour and full of flavor! Great spread on toast, or if you want to add the ‘oily’ quality of milk then mix it with yoghurt. Thank you to all the lovely people who attended the discussion on Insomnia at the Rubin Museum on Wednesday. It made me realize that this is a huge concern for many people and I know that lack of sleep can really affect quality of life. There was only time to have three people come on stage to ask questions and then I only had about 15 or 20 minutes with each person. If I were seeing someone in my office I would have more time to question, examine and prescribe a more thorough treatment protocol. There was so much more to say about this subject but I hope that this discussion helped both to demystify Tibetan Medicine and to provide a few common sense suggestions for dealing with insomnia. One member of the audience inquired about sleep apnea and I didn’t have a chance to address that so I thought I would say a bit more now. In general there are two types of sleep apnea, obstructive sleep apnea and central sleep apnea. Obstructive sleep apnea occurs when the breathing passage is obstructed and often happens in people who are overweight but can also occur in children with enlarged tonsils or adenoids. Less is known about central sleep apnea but for some reason there is an interruption in the message from the brain to breath. According to Tibetan medicine the most common reasons for insomnia are an excess or disturbance of rlung or mkrispa, however obstructive sleep apnea is most likely due to excess badkan (phlegm). Normally in Tibetan medicine we don’t think of badkan as causing insomnia because people with excess badkan usually tend to be very heavy sleepers, however, it does happen that the extra weight and tissue can cause obstructive sleep apnea. When we treat excess badkan, in general we treat it with the tastes of hot, rough, and astringent. So this would include spicy foods, lentils, buckwheat, fish, hot water, fresh cooked vegetables, warming spices and herbs such as black pepper, long pepper, ginger, and small amounts of good quality alcohol. Foods to avoid are oily, sweet, heavy and cool, as well as food that is too old and has sat in the fridge for too long, or spoiled food. This would include too much raw foods or salads (some are fine), pork (which is cool-natured and heavy), greasy foods, and cold foods and drink, such as ice cream and sodas. These foods are considered difficult to digest and damage the digestive heat. Also it is recommended to keep food portions small and to engage in regular daily exercise. This helps to maintain digestive heat and metabolism so that the food we do eat gets metabolized properly and serves to nourish us rather than producing extra weight. Avoid sleeping in the daytime, as well as cool, damp places and sitting or lying for long periods on cold ground but rather be in warm, dry places. All of these foods and behaviors will help to alleviate badkan symptoms, will often help to reduce weight and excess tissue, and thereby alleviate obstructive sleep apnea. As far as central sleep apnea, from a Tibetan perspective breathing problems can also be due to a disturbance of one of the 5 types of rlung, possibly the Srog-‘dzin (life-sustaining rlung) or the Gyen-rgyu (upward moving) rlung. The Srog-‘dzin rlung is located in the brain and its functions are: swallowing food, inhalation and spitting, burping and sneezing, clearing the senses and intellect, and steadying the mind. The Gyen-rgyu (upward moving) rlung is located in the chest and its functions are responsible for speech, bodily vigor and health, giving luster to the skin, and mental exertion. As the name suggests it moves upwards from the chest into the head. A thorough examination would help to determine whether or not this was the cause. A disturbance of either of these two types of rlung could cause a central sleep apnea and would be treated with a combination of herbs and external treatments such as horme. Hopefully this short essay offers some suggestions for those suffering from sleep apnea. Last week my daughter commented on her friend’s lustrous, silky hair and asked her what she used. The answer surprised her and me also. This kind of sounds like one of those ads that you might see in the sidebar of facebook but in this case the product really is available in your local grocery store and is not expensive. It is unusual though. Her friend said that she uses lard on her hair. Yes, I know, the thought of putting rendered pig fat on my hair seemed really quite unpleasant, but I kept hearing about how beautiful, shiny and soft her friend’s hair looked, so I thought I’d give it a try. We happened to have very high quality lard in our refrigerator that came from a friend’s farm where they had raised their own pigs organically and rendered the fat themselves. Even though it had been sitting in our fridge for over two years, when I opened it it was a beautiful white, with no smell at all and a creamy consistency. At this point you might be wondering why I would keep lard in my fridge for two years. The original intent was to make a special salve for burns with it. In Tibetan Medicine, pig fat is one of the best things to use on human skin and is especially recommended for healing burns and skin diseases. It is readily absorbed and considered very nutritive. However, I wasn’t able to get all the ingredients I wanted so it just sat there until I took it out to put in my hair. Knowing how well regarded it is in the Tibetan Medicine tradition for human skin it made sense that it could also be good for hair. I rubbed about 1 tablespoon of lard into my hands and then worked it through my hair, making sure I got the ends. You might need a bit more as I learned later that it should also be massaged into the scalp which makes sense. Then I just left it for about 30-45 minutes and then washed my hair the way I normally do. If the weather were warmer I would have sat out in the sun too to help it absorb. After I washed and dried it it felt very heavy and silky. The next day my husband (who doesn’t even notice when I get 3” cut) stroked my hair and asked me if I had done something different with my hair because it felt so nice. He loved it! Now he affectionately calls me, Lard Head. I am definitely going to make this a part of hair maintenance. Using it every shampoo is probably not going to happen, but maybe once or twice a month. After doing this I also found this interesting blog about lard as a Winter super food. You’re welcome to join us from April 13-19, for added support and community, or you can choose your own dates to cleanse and use this regimen whenever it works for you. For those of you who would like a simple approach, we’re offering a 7-day cleanse package for $35 that includes: 3 oz of Warming Digestive herbal tea blend, 2 oz of Detoxifying herbal tea blend, 4 fl. oz of organic ghee, 3 oz of kitchari spice blend, and 7 days each of the two Tibetan herbal formulas we recommend. We have a limited supply available, so if you would like to purchase one, please contact us soon. *You can include bone broth (recipe below) with dinner or in the evening, especially if you’re feeling weak, shaky, having trouble sleeping, or tend to need a lot of meat in your diet. before bed: Hot milk whipped with ghee, a pinch of cardamom, nutmeg and a little honey. *Note, begin with 2 tsp of ghee on Days 1 & 2, increase to 3 tsp of ghee on Day 3, 4 tsp of ghee on Day 4, and then reduce back down to 2 tsp of ghee for Days 5-7.